Why are there so few bridges in Russia? 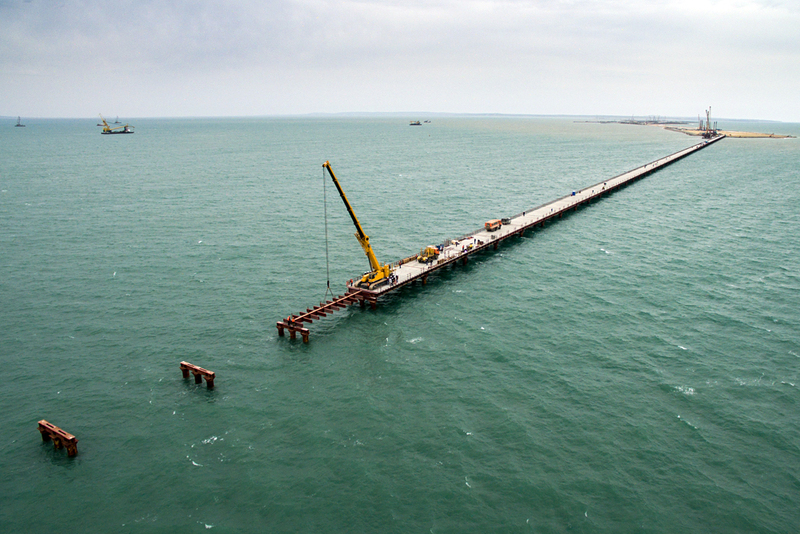 The construction of Temporary Bridge No.2 between Tuzla and the navigable part of the Strait of Kerch, at the construction site of a road-and-rail bridge which is to link Crimea to mainland Russia. The world's largest country suffers from a lack of connectedness between many of its regions. While the parlous state of Russian roads is often lamented by citizens, when it comes to bridges the situation is even more serious. So why does the country have so few bridges? Since Crimea came under Russian rule, the construction of a bridge across the Kerch Strait from the Krasnodar Territory has become an urgent need for Russia, as the disputed peninsula can be reached from the mainland only by plane or ferry. The feasibility of carrying out this complex and expensive project (228.3 billion rubles, or nearly $3.5 billion) in the midst of an economic crisis has caused debate in Russian society, which has spread to the problem of bridges in Russia as a whole. Russia is the largest country in the world and has a significant amount of water resources. One of the most challenging tasks that has always faced Russian rulers, one associated with the possibility of economic development, was to ensure communication between different parts of their vast domain. The current Russian authorities are also aware of this task: "We need to ensure, in the full sense, the transport connectedness and unity of the entire Russian territory," Russian President Vladimir Putin said in his message to the Federal Assembly in December 2012. A report by the Institute of Transport Economics and Transport Policy at the Higher School of Economics in Moscow has compared the structure of road networks in different countries. Canada, China, Germany and the United States have neat grid-like patterns, with transport links established between all states, provinces and territories, while Russia has a radial structure, with all roads leading in the direction of Moscow, where they run into a traffic jam on the ring road around the capital. The most expensive and important piece of road infrastructure is bridges – and Russia has more serious problems with them than with roads in general. According to the latest available data from the state-owned statistical agency Rosstat, published at the end of 2014, Russia has 72,500 bridges, both road and rail. Is this many or few for a country whose territory is crossed by 2.8 million rivers? For instance, the United States has 250,000 rivers and 600,000 bridges. Official statistics on the lack of bridges in Russia do not exist, but can be assessed indirectly from two indicators. Firstly, according to the number of permanent crossings – summer and winter. A total of 257 summer and 3,500 winter crossings is quite a high figure even for such a large country (according to the data collected at the end of 2014; for comparison, the U.S., according to the 2010 census, has 485 ferry terminals). Second, the lack of bridges can be judged by a detour index – the difference in the distance between points A and B on the ground and in the air. For example, in Moscow, the detour index accounts for 70-80 percent against 20-25 percent in Western metropolitan areas, according to Andrei Mukhortikov, deputy head of the expert center Probok.net. According to Mikhail Blinkin, director of the Institute of Transport Economy and Transport Policy at the Higher School of Economics, there is no city in Russia with an indicator better than 50 percent. For example, to get from the regional center of the Arkhangelsk Region to the main attraction of the region – the Solovetsky Islands (or more precisely, to the nearest settlement on the land – the village of Solovetsky), it is necessary to travel around 750 miles by car, with a detour through Karelia, although the actual distance is just 150 miles (data from the public service Yandex). Why is so little being built? The construction of bridges in Russia is moving at a slower pace than the construction of roads. From 2000 to 2014, according to Rosstat, only 200 new bridges were built. This happens for obvious reasons: They are very expensive. The Higher School of Economics has calculated that one kilometer of usual single-lane road costs 101.7 million rubles ($1.5 million on average), while it takes 579 million rubles ($8.9 million) to build a bridge of the same length. In general, however, spending on the road sector in Russia is quite small compared with other countries, when measured as a percentage of GDP. Russia spends less than 2 percent, while the norm for countries with a well-developed road network is no less than 3 percent, says Blinkin. If we measure the value of infrastructure assets as a percentage of GDP, Russia also is not among the leaders: 179 percent in Japan, 76 percent in China, 61 percent in Russia. Moreover, costs for builders are increased due to traditional Russian difficulties – weather, distance, the economic underdevelopment of territories and the urbanization of the road network (roads traditionally pass through settlements, which greatly increases the cost of land acquisition). For example, crushed stone for the construction of a bridge across the Tangnary river on the Vilyui highway in Yakutia was first transported almost 2,500 miles by rail from Kemerovo to the Tommot station, and then 285 miles by road to the site, according to Vasily Mazur, CEO of Transsakhamost, the company responsible for building the bridge. However, despite all the difficulties, the construction of bridges is big business in Russia and involves about 500 companies with a revenue volume of more than 50 million rubles ($766,000). The problem is that it is often the flashier and more expensive projects related to various events that are chosen for construction. For example, a total of 46 road and rail bridges were built on a new highway for the 2014 Winter Olympics in Sochi (the total value of all road works was 285.4 billion rubles, or $4.4 billion). A cable-stayed bridge over the Eastern Bosphorus Strait connected Vladivostok and Russky Island, which hosted the APEC summit in 2012, and is now used by students of the Far Eastern Federal University (32.2 billion rubles, $493 million). Every ninth bridge in Russia is wooden. More of these are located in the Khabarovsk Territory than anywhere else – 706, or more than 60 percent of the total number. In the Arkhangelsk Region, 66 percent of all bridges are wooden, the Trans-Baikal Territory has 624 wooden bridges, or almost half, and the Irkutsk region has 569, or more than 40 percent. However, wooden does not mean bad: In some regions wood is cheap and probably the only alternative to concrete bridges that may never be built there.